Inflammatory bowel diseases, including colitis and Crohn’s disease, are characterized by chronic mucosal injury. Previous work has shown that systemic administration of annexin A1 (ANXA1) enhances mucosal wound repair; however, it is not clear how endogenous ANXA1 is regulated. Giovanna Leoni and colleagues at Emory University determined that ANXA1 is released within extracellular vesicles (EVs) from intestinal epithelial cells and these ANXA1-containing EVs promote wound repair pathway activation. While EVs isolated from WT mice expedited epithelial repair in a scratch wound model, EVs from ANXA1-deficient mice had no effect. In human serum, ANXA1-containing EVs were present at high levels in patients with inflammatory bowel disease compared to healthy controls. In murine model of colitis, systemic delivery of targeted polymeric nanoparticles containing an ANXA1 mimetic (Ac2-26) accelerated wound repair in the intestinal mucosa. Together, the results of this study suggest that nanoparticle delivery of ANXA1 peptides has potential as a therapeutic strategy for treating mucosal injury. 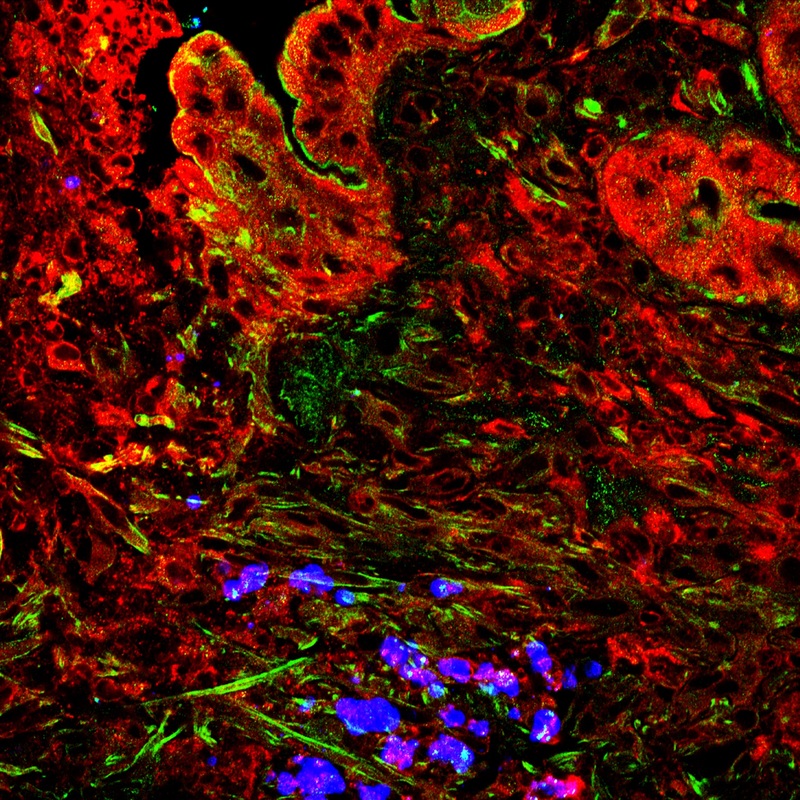 The accompanying confocal image identifies polymeric nanoparticles containing an ANXA1 N-terminal derived peptide Ac2-26 (blue) that were administered into the injured intestinal mucosa. The mucosa was labeled to localize endogenous ANXA1 (red) and F-actin (green) within the mucosal wound. Citation Information: J Clin Invest. 2015;125(3):1215-1227. https://doi.org/10.1172/JCI76693. Epithelial restitution is an essential process that is required to repair barrier function at mucosal surfaces following injury. Prolonged breaches in epithelial barrier function result in inflammation and further damage; therefore, a better understanding of the epithelial restitution process has potential for improving the development of therapeutics. In this work, we demonstrate that endogenous annexin A1 (ANXA1) is released as a component of extracellular vesicles (EVs) derived from intestinal epithelial cells, and these ANXA1-containing EVs activate wound repair circuits. Compared with healthy controls, patients with active inflammatory bowel disease had elevated levels of secreted ANXA1-containing EVs in sera, indicating that ANXA1-containing EVs are systemically distributed in response to the inflammatory process and could potentially serve as a biomarker of intestinal mucosal inflammation. Local intestinal delivery of an exogenous ANXA1 mimetic peptide (Ac2-26) encapsulated within targeted polymeric nanoparticles (Ac2-26 Col IV NPs) accelerated healing of murine colonic wounds after biopsy-induced injury. Moreover, one-time systemic administration of Ac2-26 Col IV NPs accelerated recovery following experimentally induced colitis. Together, our results suggest that local delivery of proresolving peptides encapsulated within nanoparticles may represent a potential therapeutic strategy for clinical situations characterized by chronic mucosal injury, such as is seen in patients with IBD.